Mike James is a single parent from Skowkale First Nation located in Chilliwack, B.C. Canada. He is very effective at delivering highly motivational self help programs and has being doing so since 1985. Although Mike utilizes various therapeutic counseling techniques to help participants deal with issues, his programs carry a strong Cultural foundation, this is to encourage participants to become reconnected with their own Cultural Identity; he believes this is the key to building a happy and healthy future. Mike designs and delivers programs that are “tailor fit” to address specific needs of the communities he works in; contents may include items such as: Ancient Traditional Native Games, Alcohol and Drugs, Suicide Prevention, Communication, Residential School issues, Stress Management, Youth Innovations, Coping with Crisis and many more. Mike has worked in various jobs throughout his life time but when he became involved in the helping field, he found his “calling”; Mike has a unique ability to connect with the people he works with and is very effective in helping participants become motivated in their healing journey. Mike’s most gratifying reward is when he witnesses the positive effect he has on people’s lives; in the closing circles, he often hears, “thank you Mike, you saved my life”. The Creator has offered me the ability to help people in need; my prayers go out to each and every one of these people, if I can help your community, I would like to offer my services to help build a healthier future for our society. Mike James has been delivering programs and workshops since 1985. Programs are focused on Native Culture, Healing and Ancient Traditional Native Games. Programs offered by All Aboriginal Healing & Native Games Program utilize a combination of Traditional healing practices, contemporary therapeutic group and individual counselling, presentations, large and small group work and various games to create a balanced program. 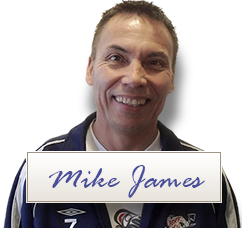 Mike James is the founder of All Aboriginal Healing & Native Games Program, he is a member of Skowkale First Nation in Chilliwack, B.C. Mike is a registered Alcohol and Drug Counsellor, Facilitator, Trainer, Sacred Bundle Carrier and Sweat Lodge Keeper. In addition to working in Native and non-Native communities throughout North America, he has also delivered Healing programs in 12 Correctional Centres for the past 16 years.